Cheers to the local beer lovers! Steve Courier, head brewer at SLO Brew in San Luis Obispo, joins the show to share his love for craft beer! 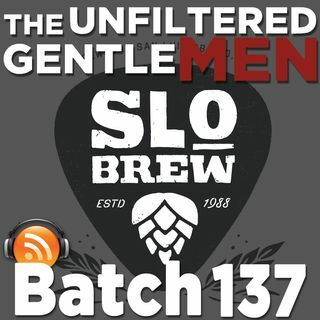 We discuss the unique history for SLO Brew, from craft beer pioneer (class of 1988) to the rocky years of being purchased, all the way to now with big production and statewide distribution now. Steve also talks about SLO's history with Firestone Walker's Matt Brynildson, losing their production facility to Firestone, rebranding, opening their ... Más informaciones new brewery, their upcoming distilling program, and so much more. In addition to SLO Brew's history Steve shares who & what got him in to brewing (at the ripe old age of 16), working with SLO through their different iterations, brewing for Firestone up in Paso Robles, what being the head brewer really means, making changes to beers that people love, his favorite beers, and more! In addition to all of the history and beer talk, Steve walks us through a guided tasting with some of SLO Brew's delicious beers. A huge thank you to Steve Courier and SLO Brew for having us and sharing their delicious beer. If you'd like to find out more about SLOW Brew, go to www.slobrew.com, www.facebook.com/slobrew, www.twitter.com/slobrew, or www.instagram.com/slobrew. And if you're in San Luis Obispo, head on over to The Rock or The Brew.